Secured word processing environment for high-stakes essay exams. What is Exam4 exam software? Examinees handwrite nothing else in their lives—except exams. And graders struggle as legibility worsens. is a major source of stress on essay exams. But letting examinees write exams on laptops brings challenges: How to control what can be accessed on the computer or over the network? How to collect, process and manage hundreds of electronic exam files? The answer has remained pen and paper. 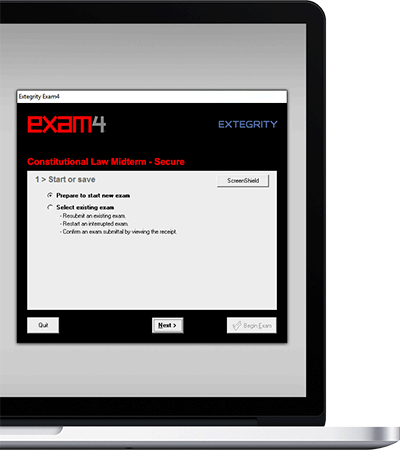 With Exam4, Extegrity offers a well-established system for exams on laptops. The software, purpose-built for high-stakes essay exams, takes the necessary control of examinee computers and creates a secured workspace for exam answers. and graders receive uniform, legible papers. Examinees type and edit the way they prefer—on their own laptops. Exam4 blocks disallowed material, protects with frequent autosaves and backups, and streamlines file collection, management, printing and distribution. Exam files are encrypted for security. Long-form high-stakes essays are typical in the study of law, and Exam4 has been part of a standard procedure used in law schools / lawyer licensing across the USA & Canada, on millions of exams since 2001. Today, an increasing variety of institutions are moving ahead with trials and adoption worldwide. Students / Examinees: Perhaps you know someone who has used Exam4. Instructors / Administrators: You may already have read about Exam4 on forums and email lists, or heard about us from colleagues. Hard drive and Internet access excluded for controlled high-stakes environments. Administrator support and tools for setting up the software and to decrypt, view, manage and download the resulting electronic exam files. Privacy focused. Nothing is collected that doesn't absolutely need to be.